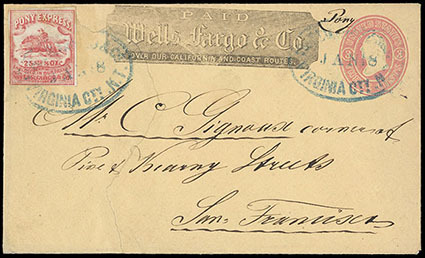 Wells Fargo & Co., 1862-64, 10¢ brown, four large margins, tied by blue "Wells, Fargo & Co. Express, Silver City, Utah" oval handstamp, and with two additional strikes on cancelling 3¢ pink (U35) buff entire with black Wells Fargo company frank to Sacramento Cal. ; restored at right including part of indicia and oval, fresh and Very Fine appearance. 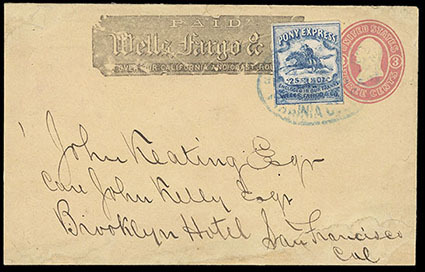 Wells Fargo & Co., 1862-64, 25¢ blue, four margins, tied by blue "Wells, Fargo & Co. Express, Virginia Cty, N.T." 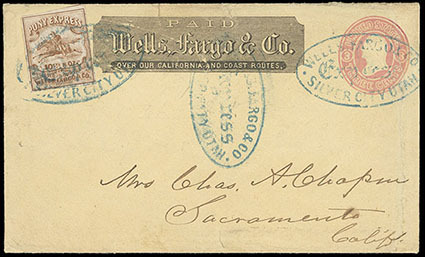 oval datestamp on 3¢ pink (U35) buff entire with black Wells Fargo company frank to San Francisco Cal. ; entire restored at bottom and top left, Very Fine appearance. This was a Private Enterprise of Wells, Fargo & Co. for the rapid handling of letters between San Francisco and the mining region around Virginia City, Nevada. Adhesive stamps were affixed to Wells Fargo franked envelopes which for the extra charge indicated by the stamps, gave rapid service by pony. Letters went from San Francisco to Sacramento by Boat, then by Pony. The service started Aug. 11, 1852 with an extra Pony Charge of 10 cents. This rate was increased in 1863 to 25 cents. The color of the 25 cents was changed from blue to red in 1864 and the service was ended in early 1865. Wells Fargo & Co., 1862-64, 25¢ red, margins to barely touched, tied by blue "Wells, Fargo & Co., Virginia Cty, N.T., Jan 18" oval datestamp on 3¢ pink (U35) buff entire with black Wells Fargo company frank to San Francisco Cal., endorsed "Pony" at top right; entire with large sealed tear and some restoration, F.-V.F. appearance, ex-Erle.